Oddly enough the Calla is not a member of the lily family. It belongs to the Araceae, and its common relatives are philodendron, aglaonema, caldium, anthurium, jack-in-the-pulpit. This plant is known by several names — arum lily, crowborough, green goddess lily, green spathe, varkblom, and most commonly as Calla lily. The genus was named for Francesco Zantedeschi (1773-1846), an Italian botanist and physician. Arum lilies are native to the Transvaal region of South Africa, where fields of Zantedeschia aethiopica can be seen waving their majestic heads in the sun. They grow tall, 120 cm. or higher, under favorable conditions and often escape into bushland and river banks. They like their heads in full golden sunlight, but their feet wet, in soil that is fertile and boggy. This evergreen herbaceous, bulbous perennial is frost sensitive, hardy to zone 8. Its leaves are long, luxuriant and quite dramatic, twisting and undulating and often speckled with white spots. Its flowers are tiny, clustered tightly in a spadix, sheathed in a creamy white spathe. The flowers are monoecious — either male or female, but both sexes are found on the same plant. The Calla has become naturalized in southern Western Australia where it has gained notoriety as a garden escapee and is considered a noxious weed, intrusively usurping valuable pastureland. All parts of the plant are deemed highly toxic if eaten raw.Toxicity derives from calcium oxalate crystals which cause a severe burning sensation, such as thousands of hot needles prickling the tongue, throat and stomach. Swelling of the lips, gastric pain and diarrhea are further unpleasant symptoms. Freud’s identification of the Calla’s sexual/psychological symbolism pervaded American and European aesthetic consciousness and informed the work of poets and artists. 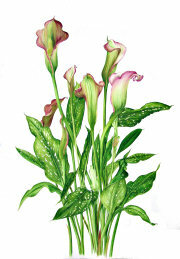 This green goddess lily is a favorite with designers and caterers, for bouquets at funerals and at weddings. Georgia O’Keefe (caricatured as the Lady of the Lily), Marsden Hartley, Tiffany, Charles Demuth, Dali, Piet Mondrian, Imogen Cunningham, Carlotta Corpron, Tina Modotti, Robert Mapplethorpe — all have celebrated the Calla in their art.